If you’re in Saratoga this weekend, and in the near-future, you have a rare opportunity, indeed. 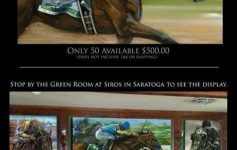 Unlike horse racing fans in New York City–Long Island–Western New York or the Southern Tier–you can go to the movies, and see “50-to-1,” the beautiful film about Kentucky Derby winner, Mine That Bird. I think it’s interesting that Saratoga is the only place where the film will be shown. Of course, this is a horse racing town, and this is the meet with more Grade 1 races than any other track on Earth. I’m posting this because I hope to help fill seats for this film. My heart’s not in writing because I just can’t get her there. I’ve tried and I’ve tried, but I can’t force her. And even if I could write something reasonably pretty–you’d all know that it was forced because my mind was elsewhere. You see, a beautiful horse whom I love, Lavender Road, is in critical condition (still, I believe), under the expert care of Rood & Riddle. Of course I won’t go into the details here–this isn’t about Lavender. But it’s been a very rough 20 hours as I’ve been crying, praying, trying to be there for her Trainer, Abigail Adsit–while also trying to stay out of Abigail’s hair and rallying troops to pray on Facebook. But I DO want you to see this film, because I know that it’s a wonderful piece of cinematography. No, I’ve not-yet seen it–I hope to, this coming week. But I’ve seen the trailer, and it made me cry. I spoke last evening with Faith Conroy, who co-wrote and co-produced the film. Even as I was choking back my pain for Lavender Road, I may have managed to carry on a reasonably intelligent conversation with the very talented young woman. She sounds wonderful, and she believes in this film with all her heart. Mine That Bird’s story is inspirational, as I said–anyone who’s ever been down, and felt kicked, has the need to cheer for someone who’s perceived as being a non-contender, but who then surprises them all. We humans all have been down–we’ve all been doubted–we all have the need to cheer/whistle/scream/cry for someone who’s kicking the butts of those who thought they held all the cards. From what I’ve seen and read, this is the film that will bring you to your feet even as it reminds you of the times that you were brought to your knees–and you overcame. Mine That Bird overcame. He won the Kentucky Derby. The son of Mrs. Marylou Whitney’s Belmont Stakes winner, Birdstone, won the first leg of the Triple Crown in 2009. We all can win our own races–as you know, sometimes all we need is a little encouragement. But after the races–after your blood has been pumping all day, and you’ve screamed your brains out–that would be the perfect time to go the movies. Sit in a darkened theatre for a couple of hours, and let Jim Wilson and Faith Conroy tell you a story. Remember why it is that you love this sport–why you love horses, and why you love Life. 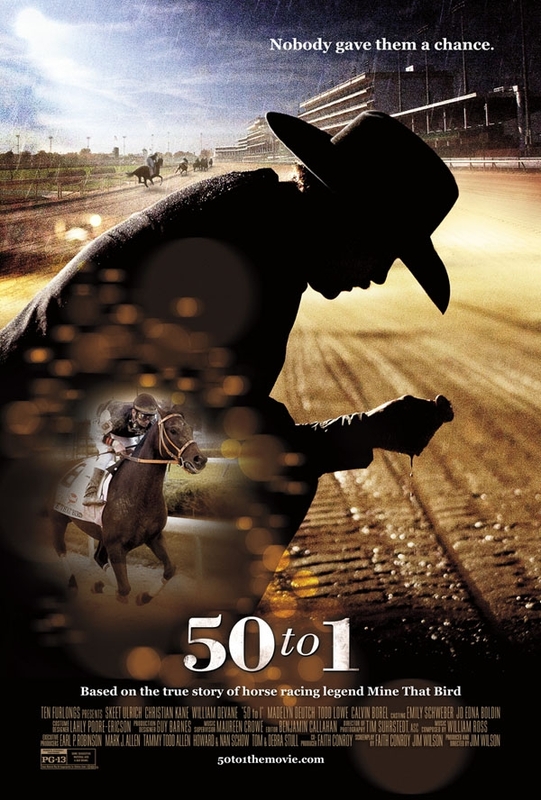 “50to1” begins its run on Friday night, August 1 at the Bow Tie Criterion Cinemas 11 in Saratoga Springs, New York. I know, most of the media promoted tomorrow night as being a “premier”–I don’t know how that incorrect information got into the hands of we media. It’s not a premier–no flood lights, no red carpet, no higher-priced tickets for those who wish to schmooze with the stars. It’s the first time that the film will be shown in New York State–and Saratoga is the ONLY place you can see it in New York State. And that’s pretty cool, in and of itself, isn’t it? Normal theatrical run, however long is determined by demand. It will be showing at 10:10 am, 1:00 pm, 4:10 pm, 7:00 pm and 9:45 pm. Those times may change Monday. On Tuesdays all movies show for $7 all day and night. I hope that, if you’re in town for the races, you will make a point to get out there and see this film. We need artists like Jim Wilson and Faith Conroy, bringing our sport to the screen that’s bigger than an iPhone, for God’s Sake. We need large-screen media to notice horse racing, and to help us grow (again). If you’re a race fan–your sport needs you to carve out some time to see this movie. Thanks for overlooking my shortcomings here this morning, friends. Go see the film, it’ll make you feel better. The very reason why I’ll make a point to see it, myself. Previous Article Race Track Chaplaincy of America, New York Division: Annual Basketball Game in Saratoga. 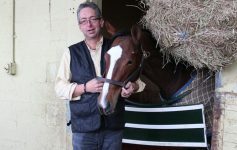 A Happy Convergence: Brian Fox, American Pharoah, Saratoga–and YOU. Her website, http://www.fillyracing.com will bring together URLs for this blog with her radio, TV and online magazine publishing endeavors. The 'site also will feature a Marketplace, Community and opps to exchange ideas about women in racing; equine welfare and rights and ways to make the sport both more nurturing for horses and more egalitarian for females. A f!lly is not a little grrrl horse: a f!lly is a Force of Nature, and through her work, Marion hopes to help reinforce this powerful Truth.